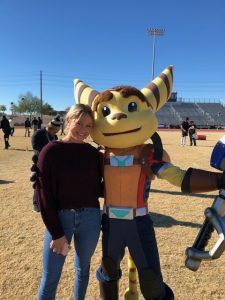 Childhelp® Arizona once again sparkles and lights up our community in their efforts to help raise funds to aid local children and their families who have suffered the effects of child abuse and neglect. 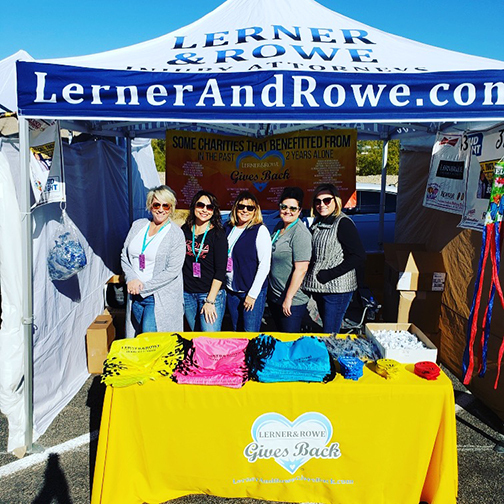 As such, Lerner and Rowe Gives Back is pleased to announce our foundation’s continuous support as a sponsor of their 13th Annual Childhelp Wings Fashion Show Luncheon to be hosted on April 28, 2019 from 10:00 a.m. to 2:00 p.m. at the Omni Scottsdale Resort & Spa at Montelucia (4949 East Lincoln Dr., Scottdale, AZ.). 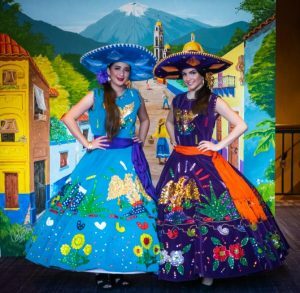 This year’s charity fashion show luncheon features silent auction items and a fashion show that includes local celebrities. Join us in supporting Childhelp Arizona! By volunteering your time, and/or offering a financial contribution, you can help this organization continue to bring hope and offer the means to help abused and neglected children live happier, healthier, and fuller lives. If you are interested in attending Childhelp Arizona’s 13th Annual Childhelp Wings Fashion Show Luncheon, please call Mallory Middleton at (480) 922-8212 or email her at [email protected] for table reservation and ticket information. WeekEnd Hunger Backpack Program provides weekend meals for Phoenix students. 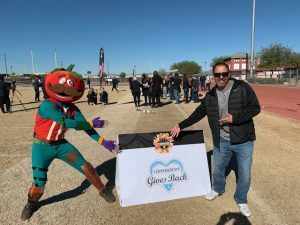 Lerner & Rowe Gives Back generously donated $5,000 to the Valley of the Sun United Way’s WeekEnd Hunger Backpacks program. Through this essential program, Valley children, who normally rely on obtaining meals from breakfast and lunch school programs during the week, receive meals during the weekend too. These weekend meals help to satisfy each child’s hunger so that come Monday, they arrive at school focused and ready to learn. 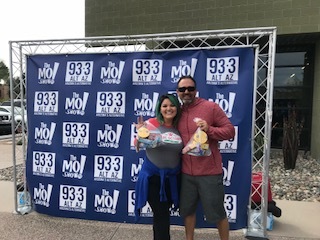 On March 20, 2019, our outreach volunteers will also team up with AltAZ 93.3 at their studio to help prepare 1,500 backpack meals. Each meal is carefully packaged in a discreet plastic bag for a student to easily carry home in their backpack. 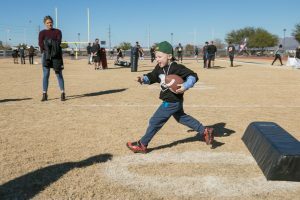 According to statistics shared by the Valley of the Sun United Way, many children who live among the 82,000 Valley households suffer chronic hunger. This hunger makes it difficult for a child to focus on school work or lessons in class, which in turn can negatively impact the rest of the entire learning environment. Now, thanks to the efforts of the WeekEnd Hunger Backpacks program, growing children are given the chance to focus on their education and succeeding (not their empty stomach or where their next meal will come from). 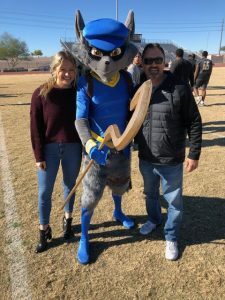 However, the program needs the support of volunteers, schools, businesses, and community organizations, such as Lerner and Rowe Gives Back, to continue to thrive and succeed. 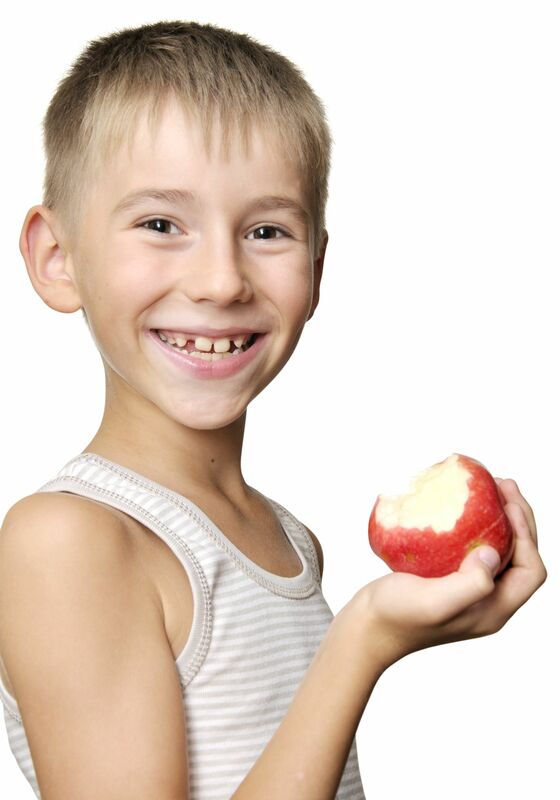 We ask that others join us in helping combat hunger among our Valley’s children. You can make a donation online on the Valley of the Sun United Way website and help provide much needed weekend meals for local youth! 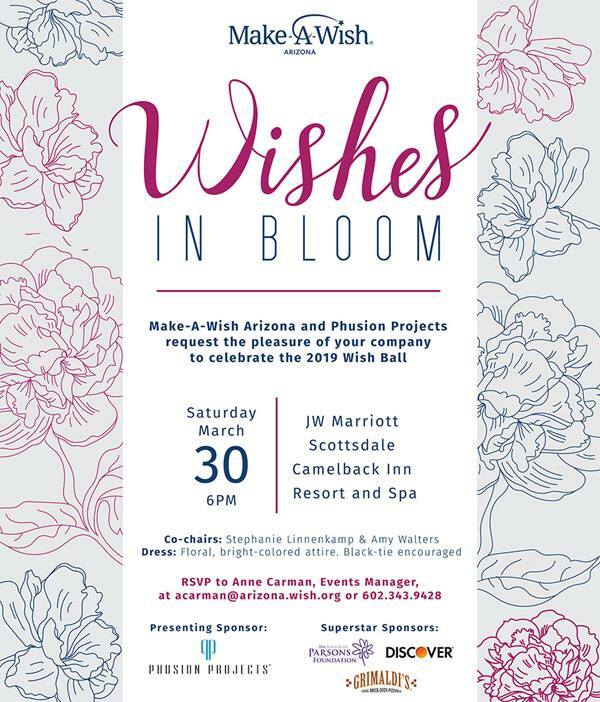 Support the 2019 Wish Ball! Lerner and Rowe Gives Back is thrilled to sponsor Make-a-Wish Arizona’s benefit gala again this year. 100% of every dollar raised goes towards granting wishes of critically ill children. Make-a-Wish Arizona works to fulfill the wishes of every eligible child in the state. By the support of donations, they hope to fulfill 405 wishes this year. This year’s theme, “Wishes in Bloom” is sure to bring a cheerful, springtime feel to the evening. There will also be musical entertainment, a wish kid moment, silent and live auctions. Want to contribute? You can in three ways. First, you can Fund-a-Wish, where guests at the ball raise paddles to donate directly. Second, you can also donate in the form of a one-time donation or multi-year-pledge. Finally, take part in our auctions.You can even start bidding in advance! Items become available on March 1, 2019. You can purchase tickets for this meaningful event by contacting Anne Carman at [email protected]. 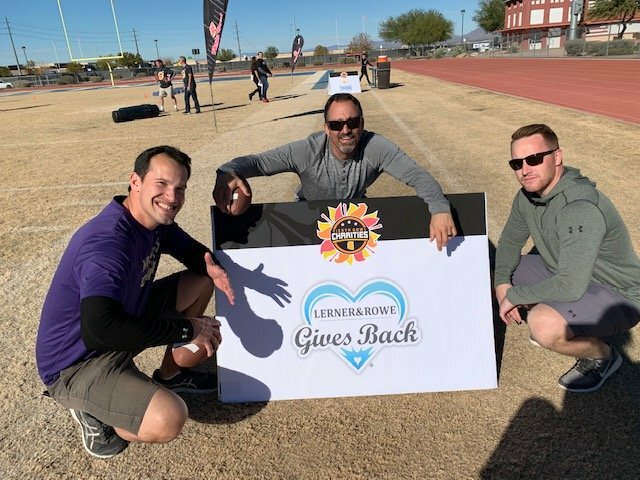 Lerner and Rowe Gives Back serves the community in Arizona daily. Our mission at Lerner and Rowe Gives Back is to make a difference in the lives of people in need. We hope to do this by giving back to the community. The Make-a-Wish Ball is one way we do this. By paying forward our successes through our non-profit organization, we hope to redirect our youth, comfort those in pain and help the people who need it most. Lerner and Rowe Gives Back is proud to announce their sponsorship of the Bad Girls Do Good Things Casino Night 2019. The evening includes “$500” in gaming chips, two drink tickets, food, and amazing prizes. 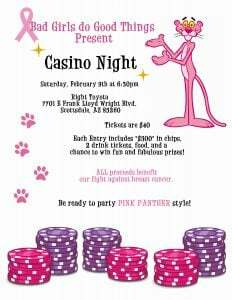 When: Saturday, February 9, 2019 at 6:30 p.m.
Why: All proceeds from this event will go towards funding the fight against breast cancer. Bad Girls Do Good Things is a non-profit organization in Scottsdale, AZ. 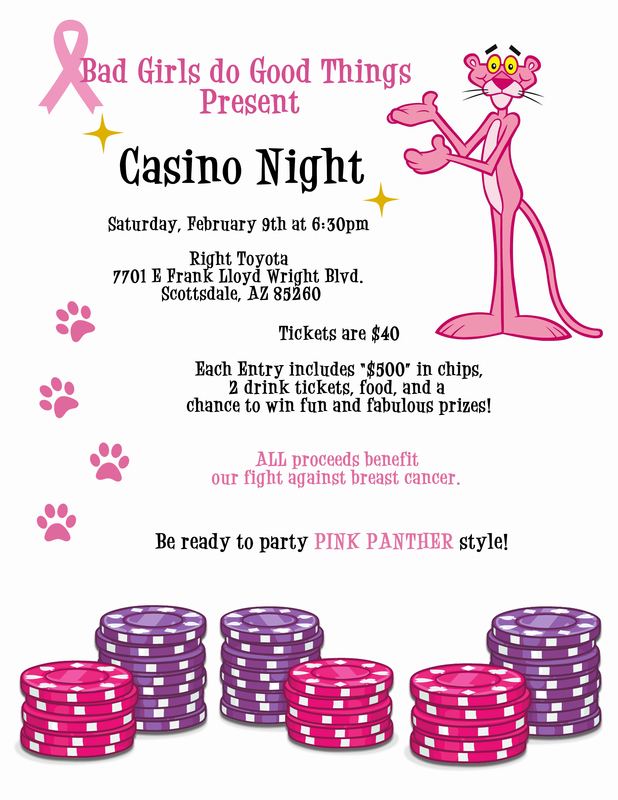 They work in the community to support and assist women suffering from all kinds of cancers.The organization presents events such as the Bad Girls Do Good Casino Night to help fund these supportive efforts. 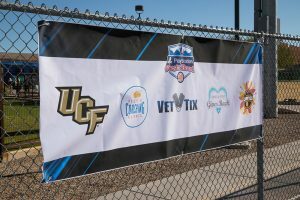 Additional fundraising events the non-profits hosts include the Bad Girls Do Good Things 3- Day Walk, the Susan G. Komen 3- Day, 60 miles walk, the annual Twisted Gold Tournament, and Sizzlin’ Summer Paint Out. When they aren’t hosting these wonderful events, they make meals, fleece pillows, and more to bring comfort to those in recovery and between treatments. 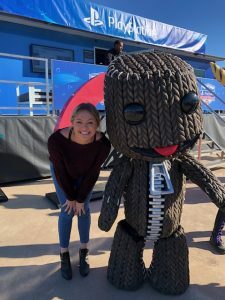 If you want to join in the fun, visit badgirlsdogoodthings.org/casino-night-2019/ to purchase tickets. Also, visit the Bad Girls Do Good Things Facebook page for updates on this exciting event. Our non-profit organization, Lerner and Rowe Gives Back, exists to give back to the community. We utilize our resources to reach out to youth, comfort those in pain, and give hope to those who need it. Our ultimate goal is to lead social changes on a much larger scale. Please look through our site to learn more about the many organization we love to support. Lerner and Rowe Gives Back is excited to do another year of sponsoring GiGi’s Playhouse Annual Gala. When: January 12, 2019 from 5:30-11:00 P.M.
Where:The Westin Kierland in Scottsdale, AZ. 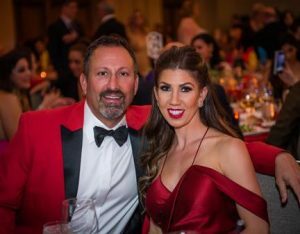 The Gala is the largest fundraiser of the year for the Down Syndrome Achievement Center, and their sixth time holding the event. GiGi’s playhouse remains the only network of Centers for those with Down Syndrome. They provide essential programs for those with Down Syndrome for free. They offer one-on-one tutoring in literacy and math. 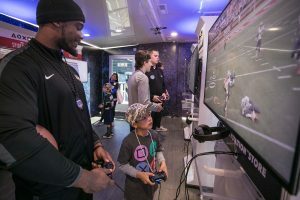 They also offer fitness and nutrition education. These necessary skills are taught to children and adults alike. They also offer career development for adults. GiGi’s Playhouse currently serves over 500 Valley area families with over 6000 program hours. 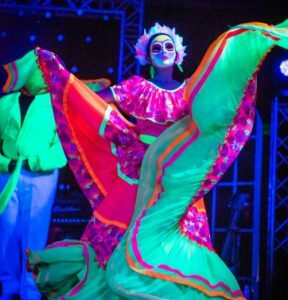 They have 38 locations across the country and Mexico. The event includes a sit down dinner and silent and live auctions. 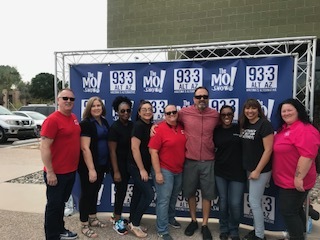 Javier Soto for 3TV will be our host. Leticia Frye will be auctioneer. A secret celebrity with surprise those in attendance. Finally and most importantly, The children and adults of GiGi’s Playhouse will be at this special event. For more information, visit www.gigisplayhouse.org/phoenix. Hope to see you there with us! 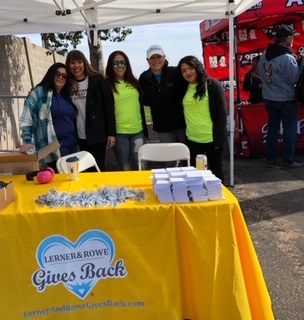 The personal injury attorneys at Lerner and Rowe look for opportunities like this one to give back to their communities. We are proud to sponsor such a meaningful event. 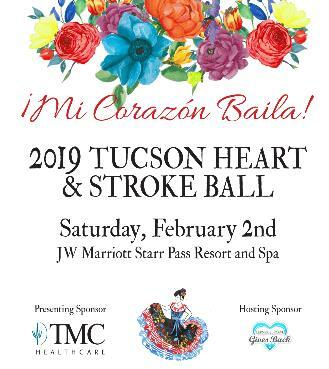 Lerner and Rowe Gives Back proudly announces its hosting sponsorship of the 2019 Tucson Heart and Stroke Ball, appropriately themed “Mi Corazon Baila!” The Arizona non-profit has previously sponsored this prestigious event and is thrilled to be working with the American Heart Association once again. 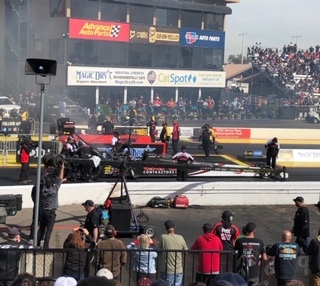 When: Saturday, February 2nd, 2019. The cocktail reception begins at 6:00 p.m. and dinner will be served at 8:00 p.m. Following the dinner, desserts will be served, and a live auction will be held to help raise funds for the American Heart Association. 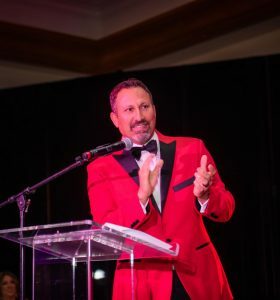 This ball celebrates the efforts of the foundation to connect, influence, innovate and invest in the heart health of local communities. 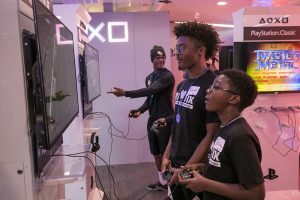 With the opportunity to Open Your Heart, attendees will help further support the mission of building a foundation of health to ensure that everyone lives a longer, healthier life. Heart health hits close to home for co-founder of Lerner and Rowe Gives Back, Kevin Rowe. It has affected his father and grandfather previously. He invites everyone to attend this event. If you can’t make it to the event, but you want to know more about Lerner and Rowe Gives Back, explore the site to read the many ways they help local community groups, organizations and individuals. Contact us today whether you are looking for more ways to give back and volunteer. We answer our phones 24/7. 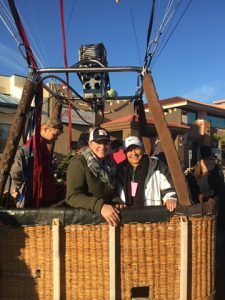 Lerner and Rowe Gives Back is excited to announce its sponsorship of the Havasu Balloon Festival and Fair for the third year in a row. 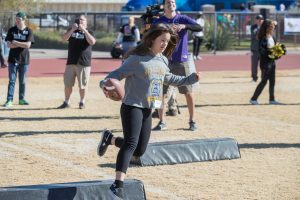 A portion of the proceeds from this fun event will be donated to local charities in Lake Havasu City. Where: Lake Havasu State Park. When: Thursday, January 10 through Sunday, January 14. Wondering if you can park your RV? You sure can. 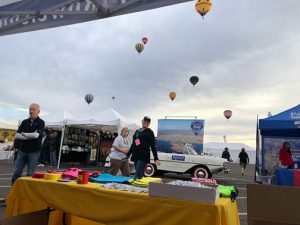 Simply follow the instructions on havasuballoonfest.com to take advantage of the Fest sponsored RV spots. 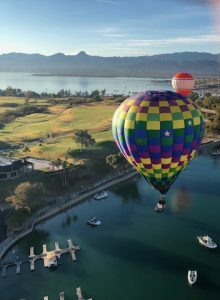 What is There to Do at the Havasu Balloon Festival? It isn’t only about hot air! 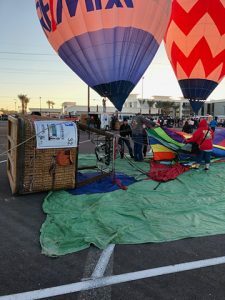 There will be live music, tethered and untethered balloon rides, VIP dinners, police K-9 demonstrations, bubble artists, and all kinds of vendors. Enjoy food and drink while taking in skydiving demonstrations or multiple mass ascensions of balloons. Don’t miss out on the Balloonfest 5K race, Golf Tournament, or the Classic Car Show. 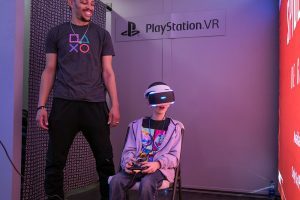 Be sure to register for these exciting events, or learn more about them, on their website.The entire event promises to be jaw dropping fun for all ages. If you would like to also be a part of this great event, a volunteer meeting will be held on Saturday, January 5, 2019 at the London Bridge Resort. Tickets go on sale on January 9. For more information, email [email protected] or call 928-505-2440. 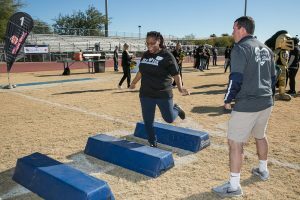 Lerner & Rowe Gives Back – Presenting Sponsors at PlayStation Fiesta Bowl UCF Player Military Outreach day. 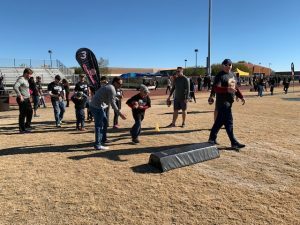 On December 30th, members of our Lerner and Rowe Gives Back team felt like they scored multiple touchdowns as volunteers at the 2018 PlayStation Fiesta Bowl UCF player military outreach day. 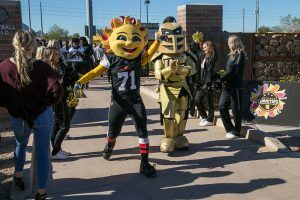 The event took place at the Scottsdale Community College after the UCF Knights completed practice. 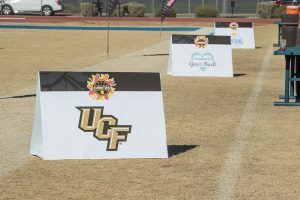 The University of Central Florida players were prepping for the Fiesta Bowl game against LSU. 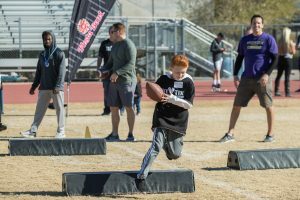 As presenting sponsors, LRGB team members were excited to assist Positive Coaching Alliance volunteers run Veteran participants and their families through different football boot camp stations. Stations varied and included practice tips on how to punt, pass and kick. 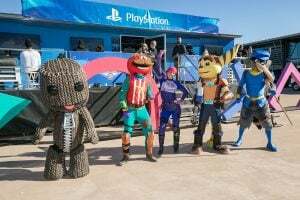 Additionally, there was a special interactive gaming truck presented by PlayStation so all those in attendance could test their gamer skills and meet PlayStation characters. 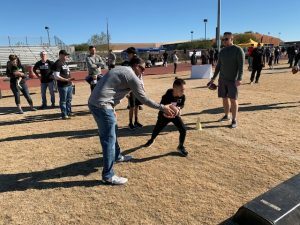 Photos from 2018 PlayStation Fiesta Bowl UCF player military outreach day are below.